After the death of Celebrimbor and the ruin of Eregion, Elrond ‘had gathered such few of the Elves of Eregion as had escaped, but he had no force to withstand the onset’ of Sauron. Elrond escaped when Dwarves out of Khazad-dûm and Elves from Lorien attacked Sauron’s forces in the rear. 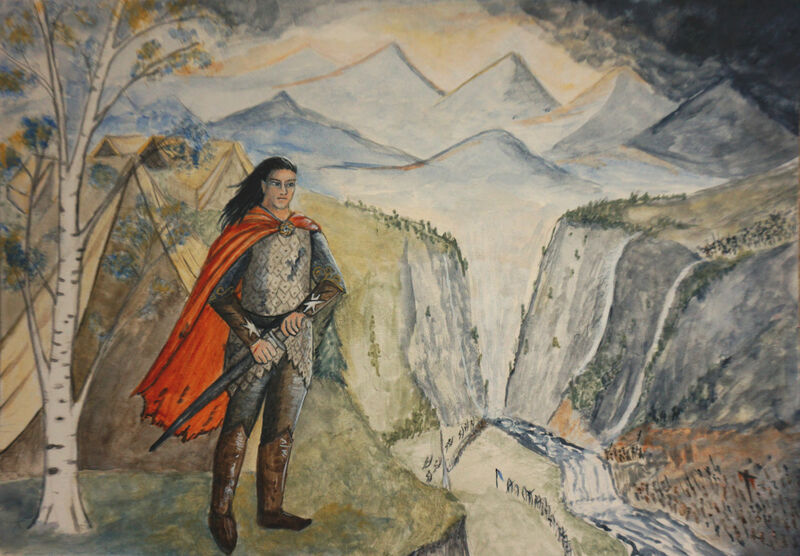 Elrond was forced North and took refuge at Imladris, where Sauron left a strong force to besiege him and prevent him coming to the aid of Gil-galad in Lindon. So here is Elrond in that first, desperate siege, before Rivendell had bridges and buildings and defences, but was instead an emergency camp and refuge for Elrond’s rescue force and the refugees of Eregion. It was three years before the siege was relieved by Ciryatur of Numenor. Oh, wow! This is my favorite I think of your illustrations. Love Elrond's stance, his cloak, and the setting/scenery. Landscapes are easier than people! But on this occasion the person seems to have come out all right. I must keep practicing. Snazzy mail shirt, and I like the tattered but still bright cloak, too. I tend to think the cloak may have started off red, and faded a bit in years of campaigning! He looks battered, but not at all cowed or beaten! Are those stars meant to link him to Gil-galad or to the Feanorians? I meant them as stars of Earendil (they are six-pointed). No doubt he could wear Feanorian stars if he wanted to in Rivendell, but one assumes his gear on this occasion was probably made in Lindon, where putting Feanorian stars on things might be seen as rather an undiplomatic political statement. I tend to assume that people from Gondolin and Nargothrond tended to stay in Lindon and it's more people from East Beleriand who went to Eregion. I did see they were six-pointed. Landscapes and animals are so much easier, but I've got to the point where I really want my people-painting issues to be sorted, so I'm working on it!